Stephen Curry and the Golden State Warriors are off to the best start in franchise history. The other half of the dynamic Splash Brothers duo is just as critical to the team’s success. In 2013, Curry left Nike for Under Armour and nearly boosted the up-and-coming brand by himself. Klay Thompson may be following Curry’s blue prints but for another athletic sneaker brand. Nike concluded 2014 with the unveiling of the Kyrie 1 and rumors began swirling for its next signature star. James Harden’s name came up multiple times and that may be true with the introduction of the Hyperchase. One thing is for certain, Klay Thompson will not be Nike’s next signature athlete. Klay has been selected to his first NBA All-Star Game as a reserve for the Western Conference. Throughout the regular season, Thompson has been wearing the Swoosh regularly but has been spotted wearing Anta shoes in practice lately. The rise of Chinese basketball shoe brands has steadily risen after Dwyane Wade left Jordan Brand for Li-Ning. If Thompson is awarded with his own signature line, the biggest problem would be accessibility to the shoes. Chinese shoe manufacturers have a tremendously small market share in the US. Li-Ning’s Way of Wade line has been an aesthetically pleasing shoe but exposure in the US has been extremely limited. Anta already has a list of recognized NBA players endorsing their product, most notably Kevin Garnett, Rajon Rondo, Chandler Parson, and Luis Scola. The most terrifying thing for a basketball athlete is the performance. Most will remember Rajon Rondo’s torn ACL from the 2012-13 NBA season. 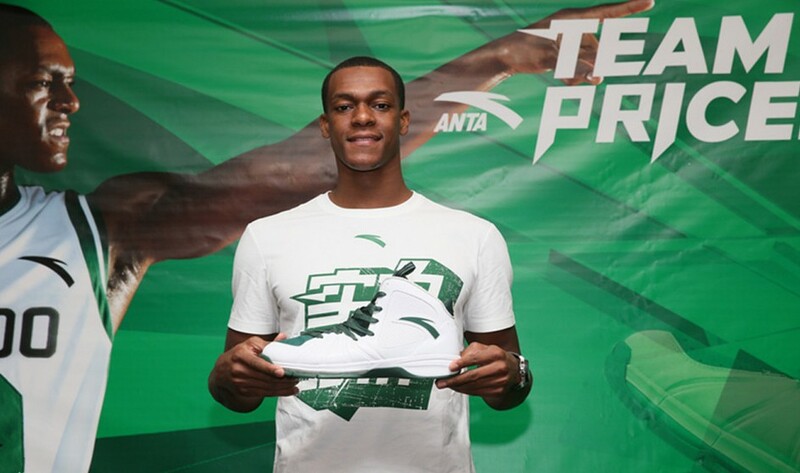 Rondo's injury occured before he signed with Anta; the company has fared well against major injuries. The company was established in 1994, in Jinjiang, Fujian province, and listed on the Hong Kong Stock Exchange in 2007, up to 2014, Anta’s market value was summed up to USD 3.87billion, which became the 5th biggest sporting goods company (market value) in the world after Nike, Adidas, Puma and Asics. Anta was also the official sportswear partner of the Chinese National Winter Olympic Team in 2014’s Winter Games in Sochi and will continue to provide clothing until 2016.